PUNE: Pune has witnessed a dramatic change in minimum temperatures, aided in part by heavy cloud cover and freak rain due to the cyclone Gaja, which struck Tamil Nadu, now over the Arabian Sea. According to Indian Meteorological Department (IMD), on November 16, the city recorded a minimum temperature of 11.8 degrees Celsius. However, on Tuesday, November 20, the minimum settled at 22.1 degrees Celsius. The maximum temperature in the city was also up to 34.3 degrees Celsius. Along with Pune, daily minimum temperatures have risen in Nashik, Satara, Sangli, Ahmednagar, Solapur and other parts of the Madhya (middle) Maharashtra. IMD Pune has forecast the minimum temperature in the city to remain between 19 deg C and 15 deg C for the rest of the week, with maximum temperatures at 33 deg C. IMD Pune also forecast light to heavy showers with thunderstorms in South Konkan, Goa and Madhya Maharashtra. 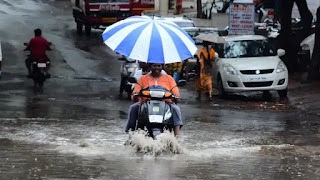 Various parts of Pune, including Sinhagad road, Salisbury Park, Katraj, Karve road, Bibvewadi and Canotnment witnessed heavy rainfall. Elsewhere in Maharashtra, Sangli and Kolhapur also reported rain.